Multiplayer gaming today is the strongest it’s ever been. Nearly every game available has options for two or more people to combine forces or clash them together. Some are built entirely for that purpose. For this, we can thank the Internet. Online multiplayer is now a goliath, with its traditional variety being left in the dust. But there was a time when playing in the same room was the norm. It’s difficult to say which home console is the ‘best’ in this variety – personal experience and differing priorities come into play. However, there’s one console that’s always very close to the top in any discussion on the matter. A system that not only provided solid multiplayer games, but innovative ones as well. Not only was the Nintendo 64 the first console to have four controller ports built in, but its library contains some of the most iconic multiplayer games ever made. Goldeneye 007 both defined and popularised the console FPS. Mario Party – as I’ve written before – gave a more laid-back kind of same-couch gameplay that hasn’t seen an equal since. Mario Kart 64 remains a popular party choice for its ease of access and explosive pace. Donkey Kong 64 and Star Fox 64 are both titles with quick and snappy multiplayer modes. Yet there was one area in which the N64 lacked tremendously – fisticuffs. N64 fighting games are notoriously few and far between. Those who were deeply invested in the genre were never Nintendo fans to begin with; SEGA and (later) Sony always provided more robust options. But amongst the bad Mortal Kombat ports and licensed crapheaps that littered the N64’s punching power was a true diamond in the rough. It wouldn’t save the N64’s reputation as a lackluster fighting games console, but it would prove a smashing success. 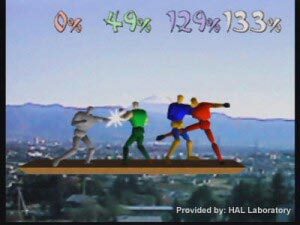 Super Smash Bros. was not only a commercial storm for the Nintendo 64, selling five and a half million units, but it was also well-received critically. Its sequels have been on every Nintendo home console ever since – and have done extremely well on all of them. 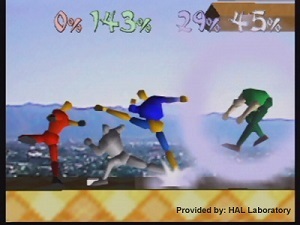 Super Smash Bros. also remains one of the most popular fighting games for competitive play; its 2001 iteration Melee is an iconic example of a strong grassroots community coming to define a game’s legacy. But Super Smash Bros. wasn’t made to be a strictly competitive game. In fact, its very existence owes itself to a lack of non-competitive fighting games in the late 90s – and an idea shared between two colleagues at a legendary developer studio. The arcade fighting game scene was very strong throughout the 1990s. 2D games like Mortal Kombat and Street Fighter, and later 3D games like Tekken and Virtua Fighter, were some of the most popular games out there. However, they had a huge barrier for entry. The games themselves were very competitive in style, and those who played them took winning very seriously. This had the unfortunate effect of turning off those who were only getting started. Kirby creator and game director at HAL Laboratory Masuhiro Sakurai lamented this unintentionally exclusionary design philosophy, and wanted a more ‘casual’ kind of fighting game. In 1998, he began putting together a side project in his spare time that he hoped would skirt around this issue. He wanted to make a fighting game that anybody could play. Sakurai ran into problems with the project’s programming, though. He eventually sought, and got, the help of then-president of HAL (noted badass) Satoru Iwata in his project’s coding and design. Iwata also had a goal. The Nintendo 64 was just under two years old, and Iwata sought to make a game that truly took advantage of the system’s four controller ports and said controller’s revolutionary analogue stick. Both Sakurai and Iwata built upon the project, eventually ending up with a functional prototype. 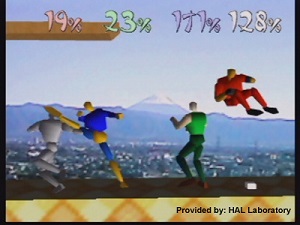 In this ‘four-player battle royal’, up to four fighters did battle on a flat arena. The game was called Dragon King: The Fighting Game, but it was missing something – identity. Super Smash Bros.’ gameplay is so iconic that I don’t even need to explain it. I will anyway, because I’m just that nice! Much of Dragon King’s gameplay was retained in Smash; unlike other fighting games in which emptying your opponent’s health bar results in victory, Super Smash Bros.’ wins are attained by smacking enemies off of the screen. 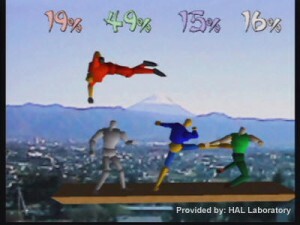 Each character displays a ‘Damage Percentage’ that determines how easy they are to launch into the air. Every hit you take increases that percentage, even going beyond 100%. In a standard game, whoever launched the most saps off the screen’s edge is the winner. Another way that the game differs from other fighting games is its lack of a real combo system. There’s no memorisation required to get good at Super Smash Bros.; each character has the same button inputs for the same basic attacks. Pressing A or B on the controller will yield regular attacks and Special attacks respectively. The real variety, and one of the secrets to Super Smash Bros.’ success, is how the control stick affects these attacks. The character roster deserves a mention as well. 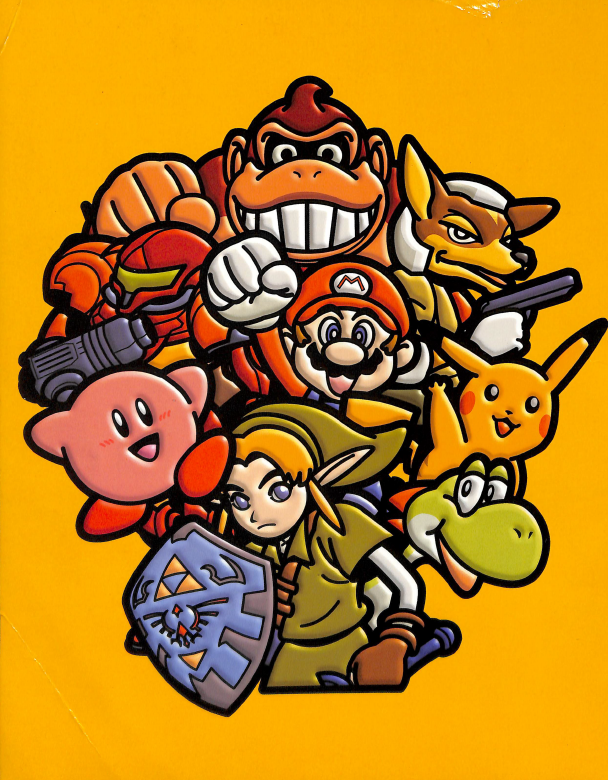 Mario, Fox McCloud, Pikachu, Samus Aran (in her first and only N64 appearance), Donkey Kong, Link, Kirby and Yoshi make up the starting roster. By completing certain objectives, more fighters can be unlocked: Ness, Jigglypuff, Luigi and Captain Falcon can be added to the fighter list. There are more unlockable things in Super Smash Bros., but these additional characters are the bare basics. Satoru Iwata’s hutch about the control stick was correct: it really did revolutionise game design. For Super Smash Bros., the stick can be used to gently ‘Tilt’ or violently ‘Tap’ in one of four directions. Tilting will make a character move but Tapping it will make them run. In addition, Tilting the stick while pressing A to perform a standard attack will determine the direction. Tapping the stick allows you to charge up a ‘SMASH’ attack, which is your best option for launching foes. 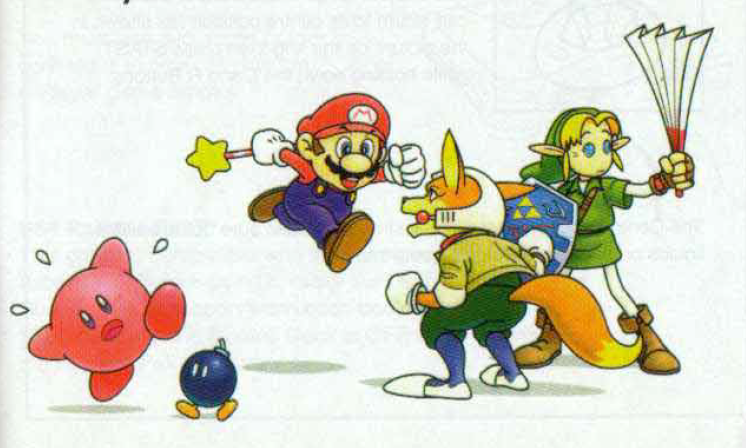 Special attacks, meanwhile, are underwhelming when compared to later entries in the Super Smash Bros. series. While later titles featured four directions of Special attack, this N64 version had but two. Bringing the control stick up (Tilting or Tapping the stick won’t make a difference here) while pressing B will activate an upper Special and bringing it down will activate a lower Special. The former is essential for recovering from particularly harsh launches into the air, and the latter is more so useful for crowd control. Other options include aerial attacks performed by inputting A-button attacks while in the air, grabbing foes to attack or throw them with the R button, and a Z-button shield that prevents damage – for a time. You can also roll by pressing the Z button and pushing the control stick. These options, while still very easy to pull off, can prove difficult to master completely. While the depth of these controls may pale when put against later games, Super Smash Bros. never quite suffers from it. On the contrary, the more limited control scheme makes the game much easier to get into! But to truly see why Super Smash Bros.’ use of the analogue stick is unique for the genre, you have to talk about the D-pad. See, by the late 90s home consoles had replaced arcade cabinets as the go-to gaming platforms. And unlike today, not every console supported fighting sticks. And even if they did, good luck affording one! So fighting games had to rely on the standardised control schemes offered by consoles; having an original control layout like they do on an arcade cabinet was no longer an option. The N64 wasn’t the first to have an arcade-like joystick, but it was the first to bring that kind of idea back. Every post-NES console worth remembering offered a D-pad instead of an Atari-esque joystick, making it the go-to option for fighting games. Even now, those who don’t have their own fighting stick swear by the D-pad because of its precision, in a standard fighting game, compared to an analogue stick. The N64 controller did have a D-pad, but barely any games used it. This includes Super Smash Bros.
A beginner fighting game player will instinctively use an analogue stick, but they’ll eventually see the light and stick to a D-pad. It gives them too precise an input method, and such a huge advantage over an analogue stick user, for them not to. In Super Smash Bros., every player is using a control stick. There’s a beautiful egalitarianism in that: If you’re good at Super Smash Bros., it’s because you’re just better. This applies to if everybody was using a D-pad as well, but remember: Super Smash Bros. is a casual fighting game. It’s not interested in being like Tekken or Virtua Fighter. The combination of not having to memorise combos and instead focusing on when and where to use the smaller number of attacks, and its mandatory control stick usage, makes Super Smash Bros. the more casual fighting game Masuhiro Sakurai always wanted – even today. It helps that Nintendo’s cast of characters lend a greater variety to these attacks. Donkey Kong’s punches and slaps are deadly at close range, Samus and Fox have more ranged options, and Link is a little bit in between. The variation in character playstyle allows players to find a character that helps their results thrive and ‘main’ them, which drives healthy competition – but not at the expense of its low barrier to entry. Because even with these simple-yet-deep mechanics to master, Super Smash Bros. is still a ‘party fighter’ at heart. Fights are spiced up with Items that appear at random points, which help or hinder you and/or your opponents. Nintendo’s universes weren’t just raided for characters and stages, items are lifted straight from them as well. Bob-ombs can be thrown before they start walking on their own, Star Rods pummel foes with the rod itself or the stars it creates, the Hammer basically guarantees KOs on contact but limit your movement options, the list goes on. The chaotic (and fun) nature of Super Smash Bros. owes itself a great deal to Items, but professional play swears by their removal even today. Different strokes, etc. If you don’t like them, though, you’ll need to take part in 100 matches before you can access the hidden game options menu. These options came straight out of the box in the series’ later entries. Gameplay is just one piece of the puzzle that make a game’s ‘feel’. Alongside its easy-to-play gameplay mechanics, Super Smash Bros. has a ‘cartoon-y’ visual and audible side to it. The game looks just about the same as any other N64 game, just about on par with games like Mario Party or Star Fox 64. While dated, I’d make the argument (and have before) that this ‘N64wave’ aesthetic should be explored more thoroughly in indie games! A distinct lack of darker colours, the angular character models, a Goldilocks amount of detail in characters and environments…there’s a nostalgic charm to it, what can I say? It’s the art direction where Super Smash Bros. starts to look more unique. From the very beginning of the game, it’s made perfectly clear that the playable characters are meant to be toys thrown together by unknown forces. Art from the game’s official material is even more akin to a comic book than a video game. I, for one, really like this game’s interpretation of Link as a gag manga-eyed noodle boy. There’s no other art direction quite like it for the N64, and it really does set Super Smash Bros. apart. The menus even have a 90s-cool background that makes them look straight out of a video game commercial or magazine. Radical, dude! It’s a shame that this direction was abandoned, because I’m struggling to find any other game quite like it. Accompanying the varied soundtrack is one of the most iconic sound designs on the N64. Super Smash Bros.’ sound effects may be off-putting at first, but they hit it out of the park with just how satisfying they make each hit. A connected attack sounds, forgive the pun, so goddamn punchy. 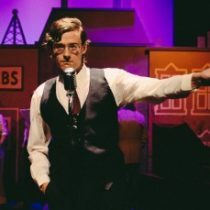 The off-screen audience will gasp when a character takes a particularly bad hit, and cheer for a fantastic performance. I genuinely miss how this game sounds, and it makes me pray for future games in the series to have a bit more fun with their sound. Despite how well everything in Super Smash Bros. is, there’s one problem: there’s not enough of it. Twelve characters and nine stages are all that’s available, and the single-player offerings are even more lacking. Unlike later games in the series, Super Smash Bros. has but one path for those who decide to go it alone: a multi-stage gauntlet for each character, with some bonus stages thrown in. This wouldn’t be so much of an issue if playing it wasn’t necessary to unlock the additional characters. Not the worst single-player offering in the world, but it does get repetitive very quickly. Thankfully, this is just one setback in an otherwise great package. The Nintendo 64’s reputation as a multiplayer console’s legacy doesn’t just come from its library’s contemporary enjoyment. Its fruits of fun remain ripe today, and Super Smash Bros. is no exception. The game is still very fun to play, even compared to its successors. The legacy it left behind is still felt very strongly; Smash games are now staples at video game tournaments and couches all over the world. It may not be the deepest, the biggest or even the best – but it’s the granddaddy of them all. The charm that Super Smash Bros. offers is too sweet to ignore even twenty years after its original release.